"Hello, Norman. The China Clippers arrived today and I cannot understand why the makers do not plaster their logo all over this excellent pen. Not just excellent for the price -- excellent, period. 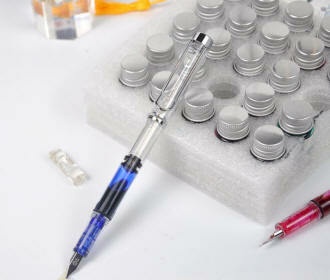 It holds a generous supply of ink. The cap screws on so it won't pop loose. The clip is sturdy and tight. 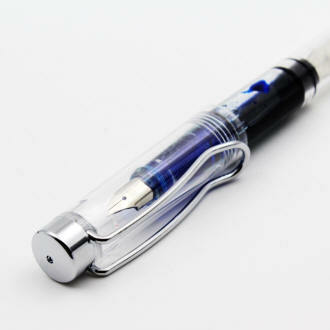 It writes smoothly even on newspaper. It feels hefty in the hand. And it has a definite style. Recommended!" 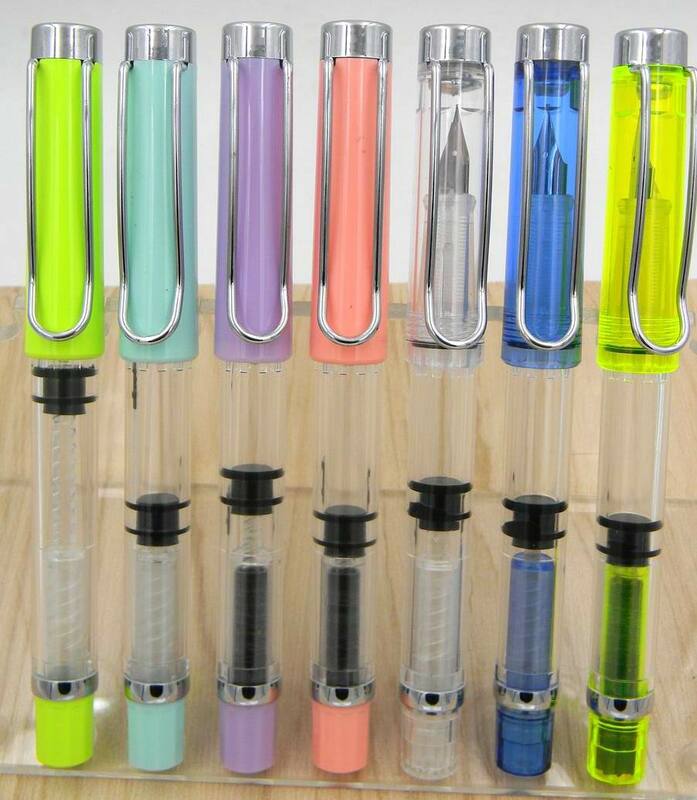 "Norman, received the pens yesterday. I have one inked up. It is delightful. Thank you." "Hi Norman, Just writing to Thank You!!! Order arrived promptly yesterday and well packaged. 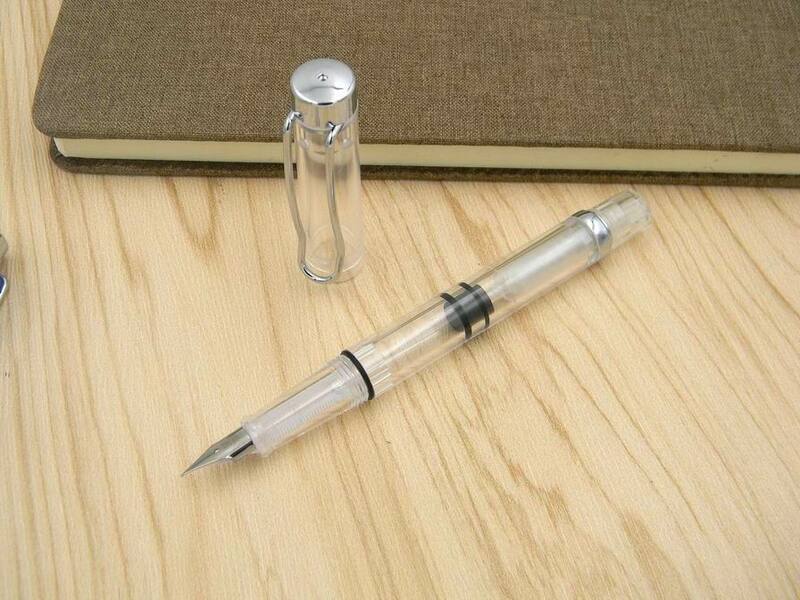 Pen is perfect and exceeds my expectations. Your video (which sold me on it) was right on. My only concern was the EF nib but indeed it writes close to an American M and is just right for me. It glides even on waste paper. Thanks again and can't wait to read about your next find to add to my collection." 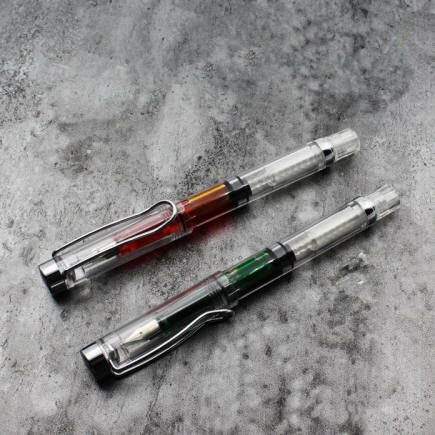 A rather large pen, this true no-name pen (not even the manufacturer in China is identified), I've decided to give it the name of China Clipper. 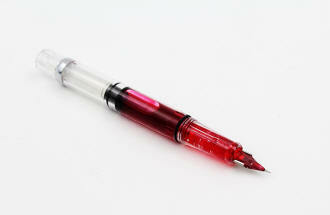 Partially this is due to the rather distinctive, Lamy-like clip. 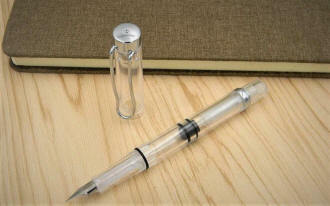 It measures 5-1/2" capped, a truly oversized 6-3/4" posted, and 5" with cap held aside. 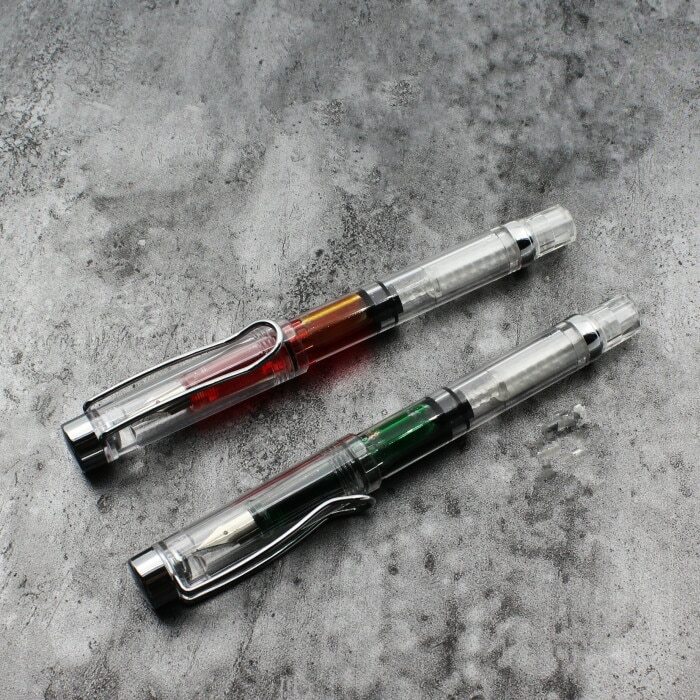 I initially imported just the Demonstrator version, to see how I and my customers liked them. Success on both fronts! 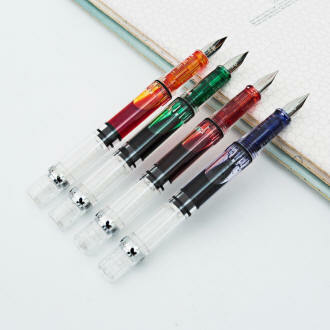 The original Demonstrators came with an XF nib only. Now we've added the F as well (both are a bit broader than a typical Asian nib). However, there's an almost infinite range of colors just with the demonstrator version -- and your particular ink color choice. 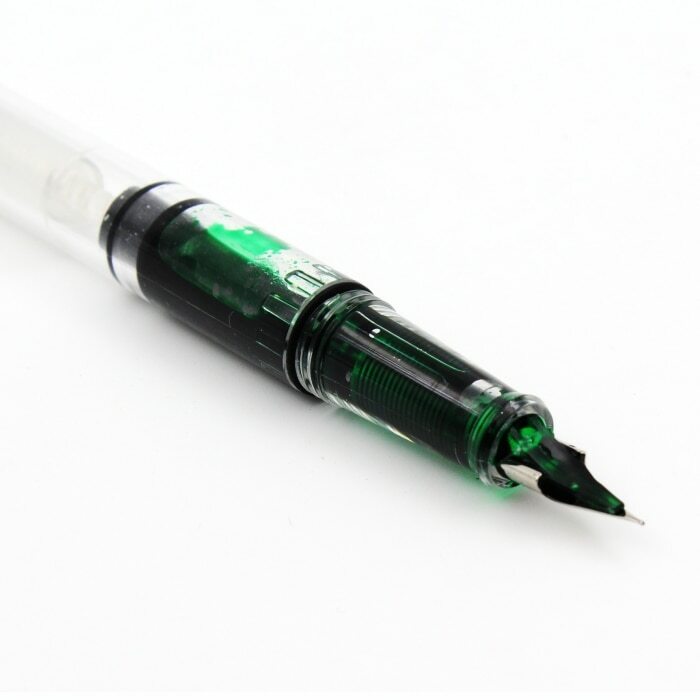 Here's a green ink, like I've used in the video above. 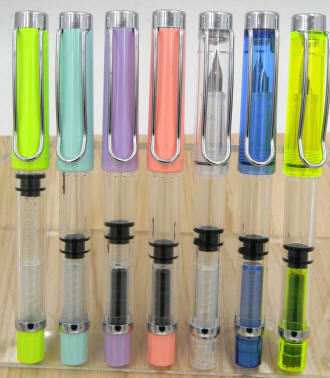 These beauties are piston fillers (so no ink cartridges, bottle fill only), with an O-ring for leakage-security, and come with a an XF or F nib. As with all new pens, I recommend to run a dilute solution of dishwashing soap (two or three drops to a small bowl of water) through a new pen a few times, followed by water only. Step one is effective at removing manufacturing oils that can tend to make the ink less than enthusiastic in heading from the filler to the nib, and step two removes the traces of the detergent you've used...which tends to have the opposite, diuretic effect.